When I was growing up, Halloween parties often consisted of dunking for apples and playing pin the tail on the donkey. Some of the more adventurous moms created scary experiences: with blindfolds on, the kids stuck their hands in a bowl of cold spaghetti while being told it was “guts”. Another bowl was filled with “eyeballs” – actually peeled grapes. Those experiences now seem silly, and modern cooks come up with all kinds of creepy Halloween dishes. As I’ve mentioned before, my daughter Carol goes out of her way to make sure that her kids eat a healthy and balanced diet. She does that with some creative cooking along with her full-time job and community responsibilities. Although not always up to her usual healthy-food standards, her Halloween meals turn into extravaganzas that almost make the requisite trick or treating an afterthought.There are several dishes which have become Halloween traditions. She has found the recipes in several sources including Epicurious.com, but she has put her own spin on them to make them hers. You, too, can go to the internet to find all sorts of Halloween recipes, but with a little thought and some creativity you can invent your own versions of scary food, keeping in mind the spider webs, ghosts, black cats, skeletons, vampires, and yes, even zombies that make up the modern cast of characters for a Halloween party. To get your brain working, here are a few favorite recipes of Carol and her kids. 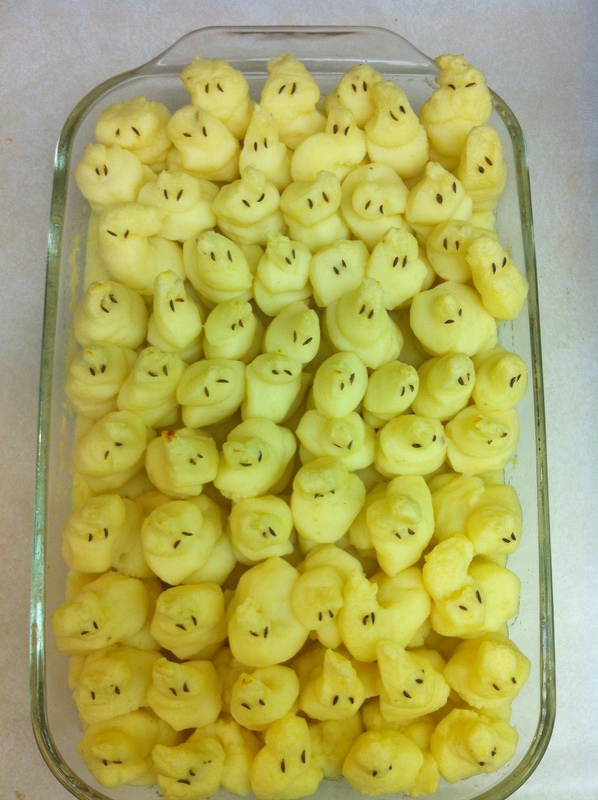 Place the cubed potatoes in a large pot of salted water. Bring to the boil and cook until easily pierced with a fork, about 20 minutes. Drain and rice with a food mill or potato ricer into a large bowl. Season with salt and pepper. Keep warm. While the potatoes are cooking, combine the butter and milk in a small saucepan and heat over a medium flame until the butter is melted. Combine until smooth the riced potatoes, butter and milk mixture, and egg yolks using an electric beater. Spread about one-third of the mixture in the bottom of a 1-quart baking dish. Then transfer the remaining potatoes to a pastry bag fitted with a ¾ inch plain tip. In a heavy metal oven-proof pot with lid, heat the oil over a medium-high flame on the stove. Add the short ribs, turning them frequently until evenly browned on all sides. Remove the browned ribs to a plate. Add the onion, celery, and large carrot to the pot, Add more oil if necessary. Brown the vegetables over medium-high heat. Then return the ribs to the pot. Add the garlic, thyme, bay leaves, beef stock, red wine, tomato paste, and Worcestershire sauce . Bring to the boil. Then cover. Transfer to the middle of an oven preheated to 225°. Continue to braise for at least three hours or until the ribs are tender and the bones are loosened. Check from time to time and add more liquid if needed. About 40 minutes before you are ready to serve, add baby carrots. When the meat and vegetables are thoroughly cooked, remove the pot from the oven. Discard the onion, celery, large carrot, thyme, and garlic. Transfer the ribs and baby carrots to a plate. Cover with aluminum foil and keep warm in the oven. Drain the liquid into a sauce pan, skimming any excess fat. Then bring to a boil over a medium-high flame and reduce to about one half. Correct the seasoning with salt and pepper and stir in the corn starch dissolved in ½ cup of water. Stir constantly until the sauce is thickened. Add the lemon juice and stir briefly. Adjust seasoning with salt and pepper. Remove from the heat. 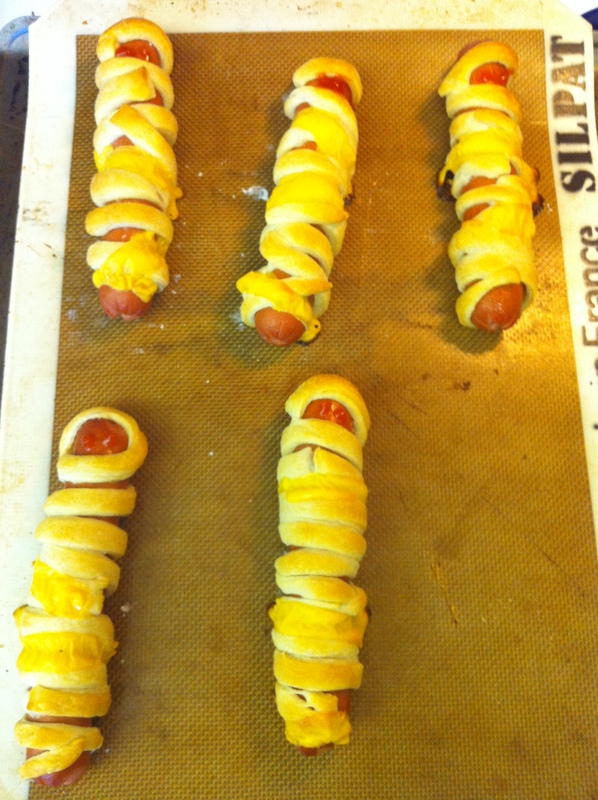 Wrap the frankfurters in the strips of dough to resemble mummy wrappings. If you wish, leave one end of each frankfurter free for a “face”. Place the wrapped frankfurters on an ungreased baking sheet. Spray them lightly with cooking spray and bake them for 15 minutes in an oven preheated to 375°. Remove from the oven. Decorate, if desired, with dots of mustard for “eyes” and serve immediately. Cut 1½ inch cone-shapes from the centers of the tops of the cupcakes. Reserve the cones. Frost the tops of the cupcakes, leaving the hole free. Place the thawed whipped topping into a large zippered plastic bag. Cut off a corner of the bag and use it as a pastry bag to pipe whipped topping around the ice cream ball and around the base of the cone-shaped cake on top of the ice cream. 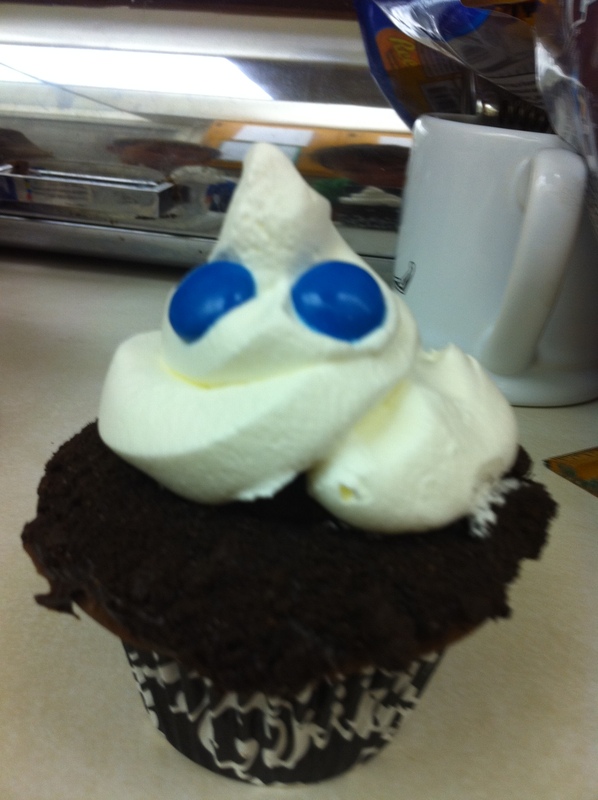 Then pipe more topping to cover the cupcake and to make a peaked ghost head that covers the ice cream and cake cone. Decorate the ghost head with two M&Ms for eyes. Return to the freezer until ready to serve. If frozen solid, let the frozen cakes stand at room temperature for 10 minutes before serving. Macaroni and cheese is as American as you can get. Some authorities attribute its invention to Thomas Jefferson, although that is probably apocryphal. Jefferson did bring pasta machines to the United States, but the first known published recipe came from a Philadelphia chef in the early 1800s. Whatever the real origin, the dish soon became popular in Virginia and the rest of the South. It appeared on the tables of many Southern homes as well as hotel and railroad diner menus for many decades extending into the twentieth century. Early recipes called for boiling the macaroni for an hour or longer until it fell apart. 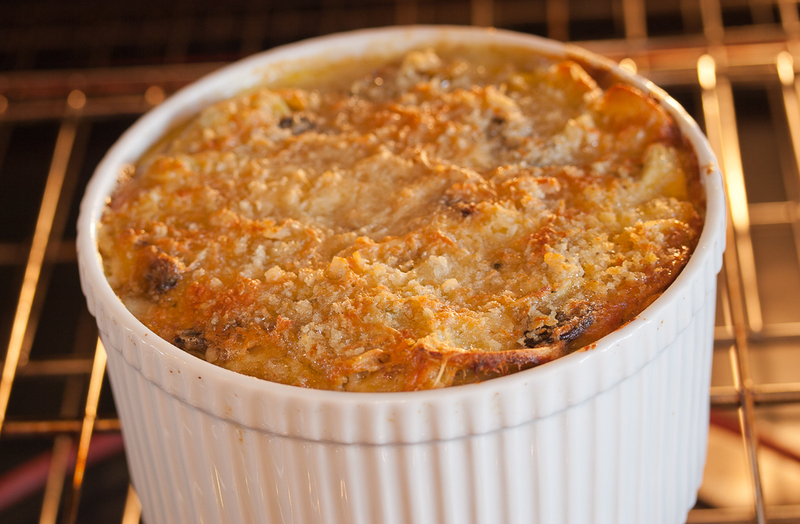 Then it was combined with cheese, covered with bread crumbs, and baked into what resembled a sort of pudding. Honestly, it sounds pretty disgusting regardless of its popularity. The real event for mac and cheese, though, came in 1937 near the dawn of the prepared food rage that still engages America’s home cooks. Kraft brought out a boxed version complete with dried macaroni and a powdered cheese sauce that was billed as cheap, fast, and easy. The original recipe on the box called for bread crumbs on top and baking, but these embellishments were soon abandoned in favor of speed. Boxed mac and cheese was immediately popular and became more popular during the Second World War. After the war, when the whole style of home cooking was changing, it became a real favorite, especially with kids. 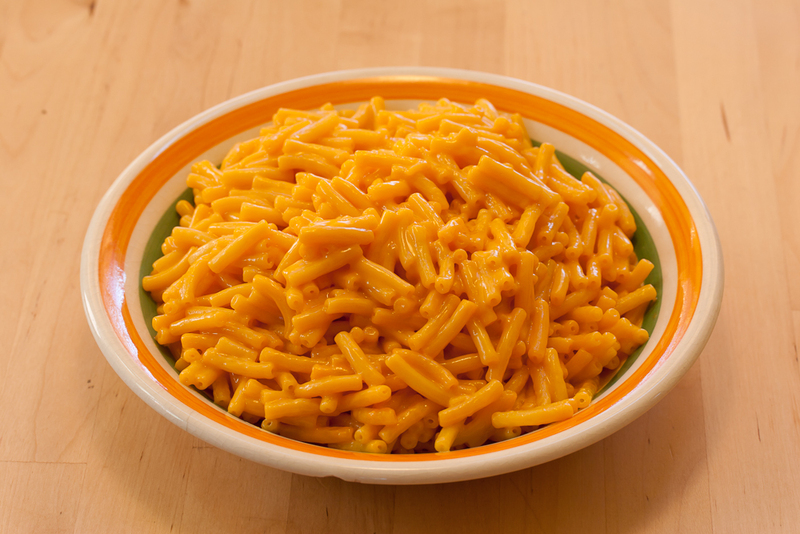 I remember loving mac and cheese as a child – pouring the macaroni out of the box into the boiling water, waiting for it to cook, draining it, and adding the powder from the little envelope along with some milk and butter. My grandkids still love that version, and when all else fails to please their finicky kid-type appetites, macaroni from the box is sure to appeal to them. For me during college days, boxed macaroni was a standby along with ramen noodles. Maybe that’s why and when it lost interest for my more grown-up tastes. These days, restaurants including some very high-end places in our town are bringing out their fancy versions of this old-time favorite. You may find mac and cheese made with bleu cheese, green chiles, goat cheese, curly pastas, mushrooms, and even truffles. Another favorite comfort food, especially if you are a Southerner or even if you have only visited the South, is shrimp and grits. This delicacy of Southern cooking has a lot in common with macaroni and cheese – a smooth creamy base of starch, oozing, gooey cheese, and maybe a little crust on the top to give it just a bit of bite. A couple of weeks ago, I was wondering what I could do to liven up the mac and cheese that I was making for dinner. What I came up with is this riff on shrimp and grits. It is guaranteed to be gooey and loaded with cheesy flavor. The shrimp, bacon, mushrooms, and artichokes make it a lot more substantial than the old-timey product made straight out of the box. I doubt that my grandkids would like this version, but I certainly did. You can use regular elbow macaroni for this dish, but it is more interesting to use different shapes or colors that you have been wanting to try. I have used foglie di carciofo, a flat, round pasta flavored with dried artichoke. It seems perfect for the dish, but any other would do. Generously butter the inside of a two-quart baking dish. Coat the insides with panko and set aside. Reserve additional panko for the top. In a large pot, bring 2 quarts of salted water to the boil. Add the pasta and return to the boil. Cook the pasta for 12 minutes or until al dente, stirring frequently. Drain and return to the pot. Set aside. In a 9 inch heavy-bottomed skillet over medium heat, sauté the bacon until not quite crisp. Remove the bacon and drain it on several thicknesses of paper towel. Chop coarsely and set aside. Then add the mushrooms to the still hot skillet and sauté in the bacon fat until lightly browned. Add the artichoke hearts and shrimp and continue to sauté until the shrimp are pink – about 3 minutes. Set aside. In a medium sauce pan over medium heat, melt the butter and add the flour, stirring constantly to make a light roux. Be careful not to brown. Add the milk and cream and stir constantly until thickened. Add the grated cheeses and sour cream and continue to stir until the cheeses are completely melted. Pour the mixture over the reserved pasta. Add the mushroom, artichoke, and shrimp mixture and stir gently to combine. Adjust the seasonings with salt and pepper. Transfer the mixture into the prepared baking dish, top with additional panko and grated Parmesan cheese. Baste the top with melted butter. Bake in the top third of a preheated oven at 350° for about one hour or until the top is golden brown. Transfer to a cooling rack for about 5 minutes and then serve immediately. Ricotta is an Italian concoction. The term means “cooked again” because the original version was made from the whey which was the byproduct of the making of other cheeses. The whey would be heated, acidified, and allowed to curdle before straining into a thick semi-soft curd which was used to enrich many other dishes. Ricotta made from skim milk is common on grocery shelves, but now even the Italians often make it from whole milk and even cream. The result is a delicate cheese that resembles fresh farmer’s cheese or cream cheese. There is really no comparison between store-bought and home-made ricotta. 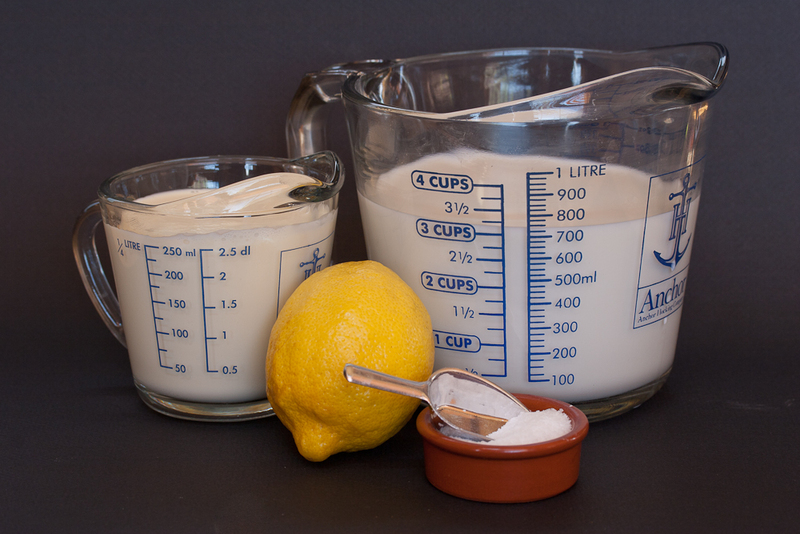 You can use vinegar, lemon juice, or other acids to form the curd, but to my taste, lemon juice is preferred because it imparts a fruity tang that enhances the delicacy of the ricotta. 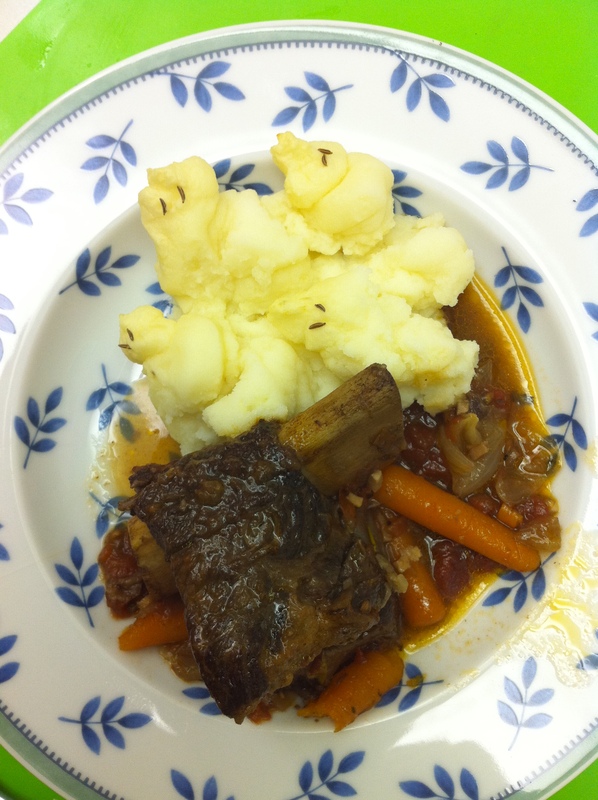 Here is a recipe from Sarah, who used hers for a dish in one of her pop-up dinners. Using her recipe, you will be amazed at how easy it is to make your own ricotta and how much better tasting it is. You may never buy it again. Once you have made your ricotta, the next decision is what to do with it. First off, dip in a spoon and taste it. That should give you some ideas. The hazard with that approach is that you will be tempted to eat the whole thing. The silken texture, subtle lemon flavor, and the sweetness of cream should all come through. These qualities make fresh-made ricotta a perfect foil for fresh fruit or a fruit compote. Even thick sauces like chocolate or butterscotch are excellent complements. Naturally, one thinks of using it in a lasagna, but it would be a shame to overwhelm the flavor by store-bought noodles and the thick marinara sauce so common in lasagna today. Consider using homemade pasta along with a light saucing of the ricotta alone or with spinach. Go light on the cheese as well. 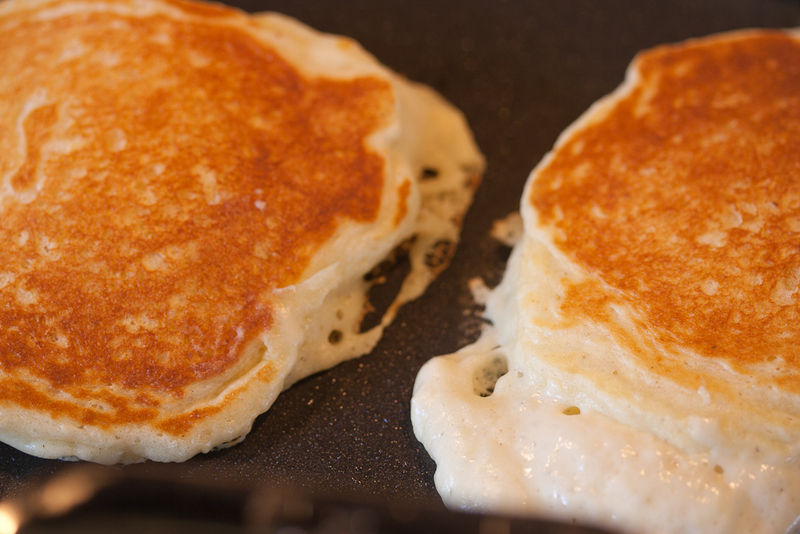 Ricotta pancakes are a perfect choice for highlighting the delicate flavor of the fresh stuff. 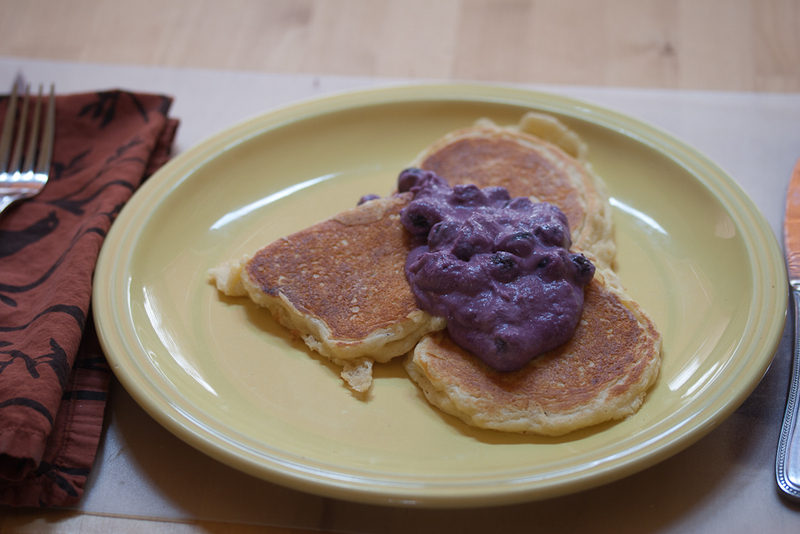 The following recipes use the whole batch you have made: part of it going into the pancakes and part of it going into the blueberry sauce to serve on top. The recipes should make enough pancakes to serve four people. Leftover batter – if there is any – can be used to bake more pancakes which, after cooling, should be separated with waxed paper, wrapped tightly in plastic and foil, and frozen for another day. Remove from the heat. Add the lemon juice, stirring gently 2 or 3 times to completely mix. Let rest for 5 minutes. Line a colander or large strainer with dampened cheesecloth or a moist, clean kitchen towel. Place the colander on a large bowl to catch the whey. Pour the coagulated milk/cream mixture into the colander and let it drain for one hour. 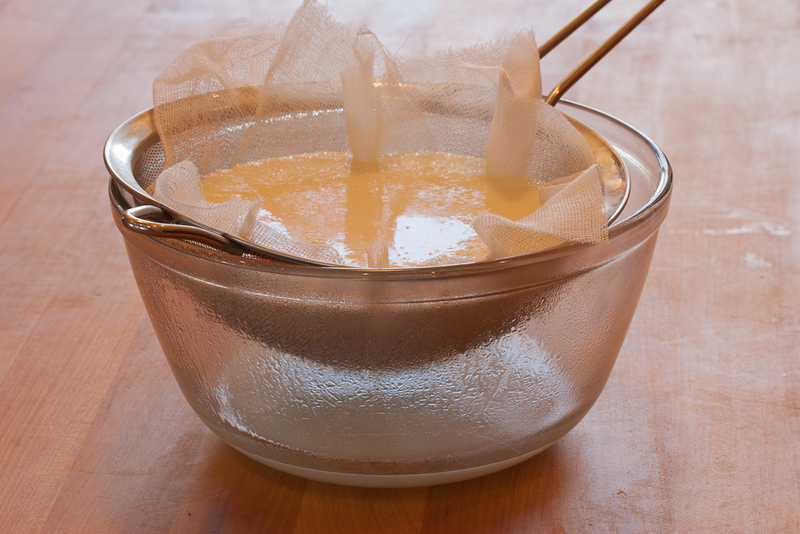 Transfer the drained ricotta to a bowl, cover, and refrigerate. In a medium bowl, whisk together the egg yolks, buttermilk, sugar, and ricotta. In a third small bowl, beat the egg whites until they form stiff peaks. Pour the dry ingredients into the wet ingredients and whisk until combined. 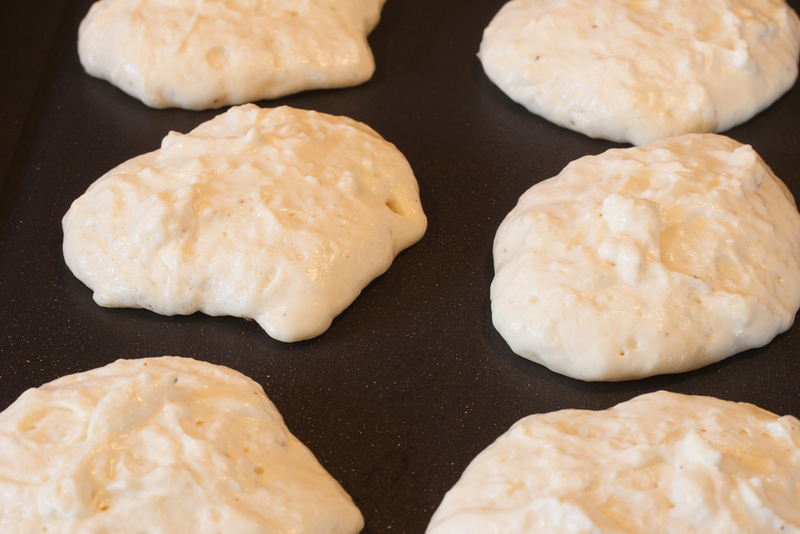 Drop the batter by 1/4 cupfuls onto a preheated, lightly greased griddle. Bake until bubbles form and burst on the tops. Then flip and bake on the other side until both sides are golden. Serve immediately with the blueberry sauce. Stir in the ricotta, vanilla extract, and limoncello, stirring until just warmed. ahead and chill. 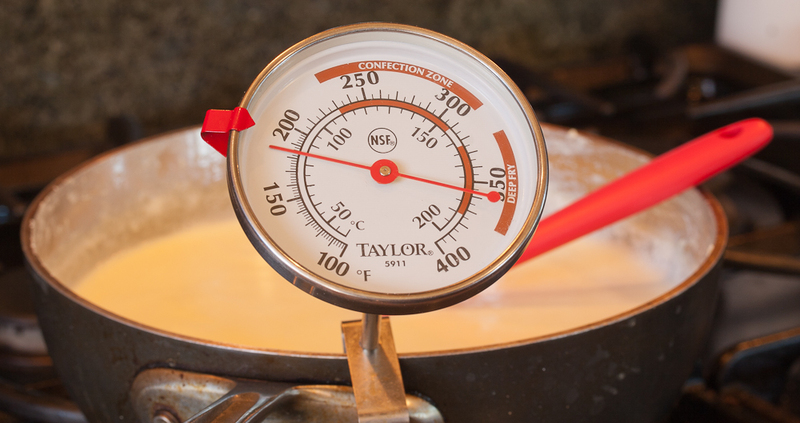 Let come to room temperature or warm gently before serving. 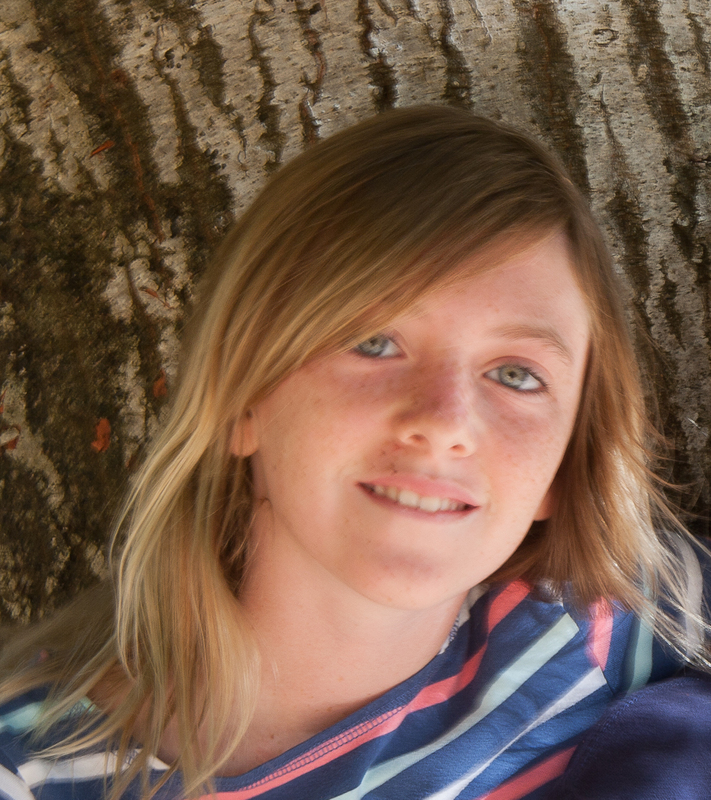 My granddaughter, Ciara, will turn 11 in just a few weeks. She has been cooking with her mother, Carol, for many years. Carol is a good and dedicated home cook who has been having kitchen fun with her children for a long time. For years she has had a fish bowl on top of the refrigerator. The bowl is filled with little slips of paper labelled with countries of the world. Each week the kids draw a slip from the bowl, and the identified country becomes a project for the next week. Finding it on a map, identifying the capital on the web, reading about the geography and history all become assignments above and beyond the usual homework. The highlight of the whole week, though, is preparing a meal that is representative of the country. For places like France and Italy, that is easy, but Tajikistan, Cote d’Ivoire, and others present real challenges. After the menu is selected and recipes have been found from exotic cook books or Epicurious on-line, my daughter makes runs to the appropriate grocery stores or specialty shops to find the ingredients. One additional rule is that everyone has to eat at least three bites. Sometimes the dinner falls flat, and everyone eats three bites and then looks for something else. More often than not, though, these foreign foods are a great success, and the children have had new eating experiences – no finicky eaters here! (or at least not too bad). Holidays are other times for adventures in food. One of the biggest successes and now a tradition has been Halloween with ghost mashed potatoes, cooked fingers, bone snacks and other gory treats of the season. I shall report further with recipes for Halloween in a couple of weeks. With as much fun as all of this in the kitchen, it is not a surprise that Ciara has developed an enthusiasm for cooking. So it seemed the expected thing when she decided on a cooking class as one of her electives for sixth grade. Be advised: this is not the home economics class of my days in high school. The class includes boys, and it focuses on good food without getting bogged down in the boring lessons on home canning, sauerkraut making, and cooking with three different kinds of condensed soup or flavored gelatin. The following recipe is an example of this modern approach to teaching kids how to cook and how to think about good nutrition. It looks delicious and tastes good along with being easy to make. 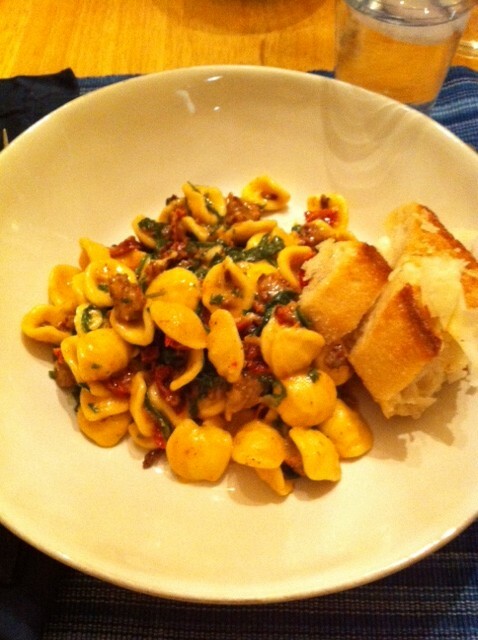 The main stars of the dish are fresh bulk Italian sausage and orecchiette pasta. The pasta originally comes from Paglia, the region of Italy at the heel of the boot. The name means “little ears” because of the shape – which is perfect for holding some of the sauce. At least in big cities, orecchiette has become much easier to find, but if you can’t find it, don’t despair – any pasta with a lot of body will do. In a medium heavy skillet over medium heat, brown the sausage, stirring frequently to break up any large lumps. Transfer with a slotted spoon to several thicknesses of paper towel to drain. Pour off all but 2 tablespoons of the cooking fat, return the skillet to the heat, and add the onions and garlic. Correct the seasoning with salt and pepper. Cook until the onion is browned and caramelized, about 12 minutes. Stir cream, sun-dried tomatoes, and sausage into the onion mixture, stirring until thickened, about 3 minutes. Remove from the heat and add the arugula, stirring until the greens are lightly wilted. While the sauce is cooking, boil the orecchiette in a large pot of boiling salted water for about 12 to 15 minutes or until the pasta is al dente. Drain the pasta, reserving one cup of the cooking water. Add the drained pasta to the sauce along with the Parmesan cheese. Mix to coat the pasta with the sauce, thinning if necessary with the reserved cooking water. Add the basil and serve immediately. A few years ago, my wife Susan and I compiled a family cook book based upon the hundreds of hand-written index cards in our jammed recipe box. We also asked our children to send us their favorite recipes. 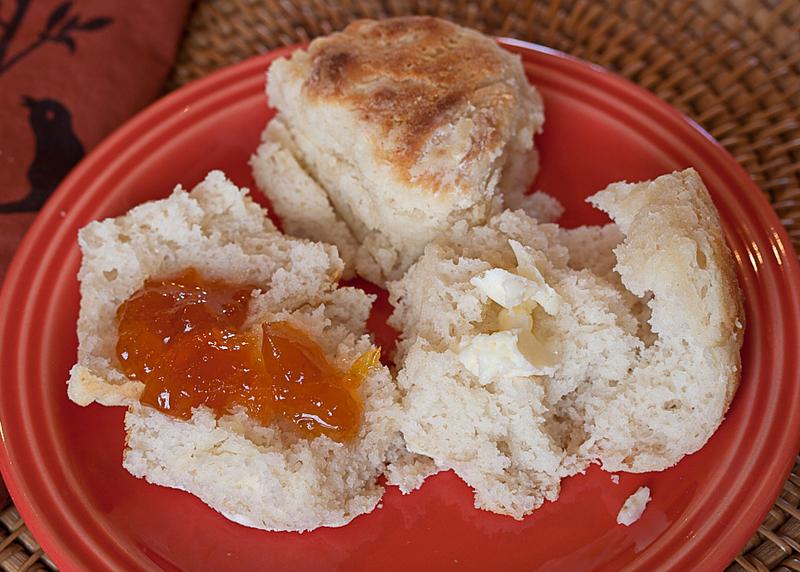 Carol, our older daughter, sent us a recipe for “Touch of Grace Biscuits” which she described as one of her favorites. Although she was born in the Mountain West, she grew up in the Deep South, so her palate often favors Southern tastes. She has perfected Touch of Grace Southern biscuits. There are lots of recipes for biscuits, but few of them seem to rise up tall with a flaky inside. These definitely do. 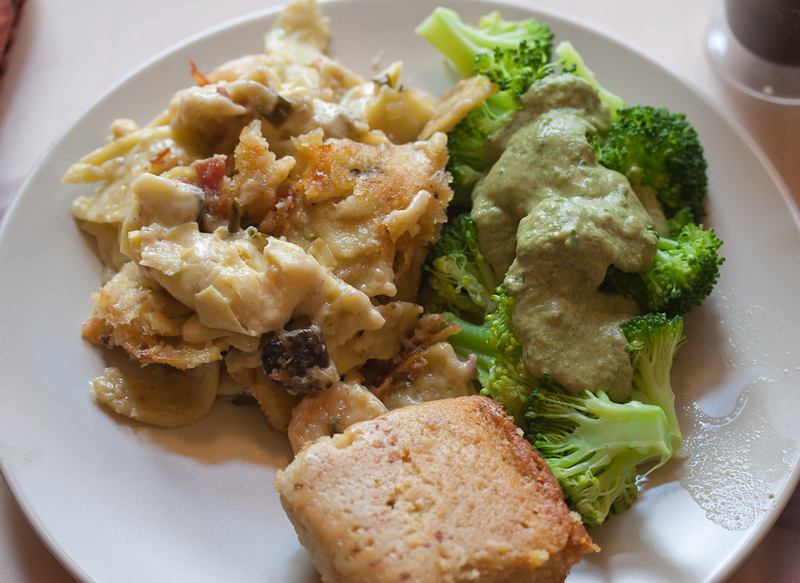 This recipe is one of Carol’s specialties that she gleaned from a couple of Southern cookbooks. There are various explanations for the “touch of grace” title, but they all trace back to the noted Southern food expert and cook book author, Shirley O. Corriher. 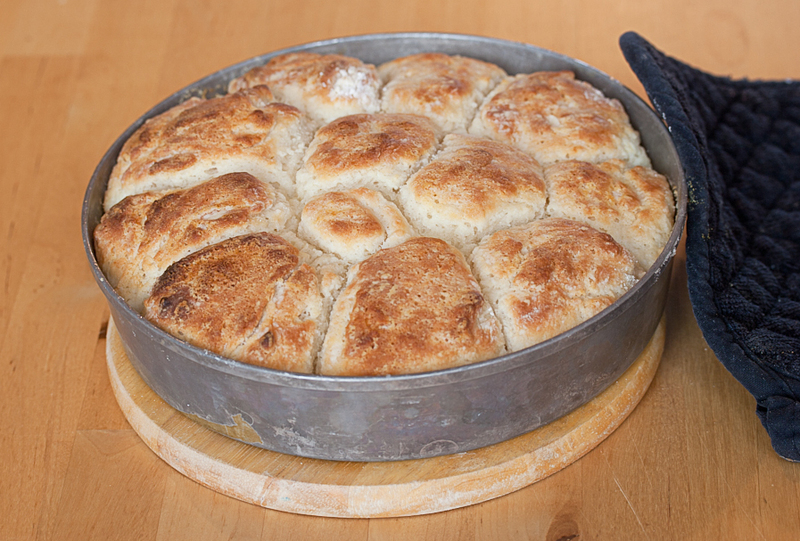 According to Bernard Clayton in his encyclopedic “Complete Book of Breads”, six Atlanta cooks including Shirley Corriher were gathered together by Nathalie Dupree to create the best Southern biscuit from a large collection of recipes. Ms. Corriher offered up her grandmother’s recipe which she described as made with a “touch of grace”. Another version says that the source was a hand-written note in the margin of the recipe. Ms. Corriher herself describes the origin of the name in her own book, “CookWise: the Secrets of Cooking Revealed”. Unable to duplicate her grandmother’s biscuits, Shirley Corriher asked, “Nannie, what did I do wrong?” to which her grandmother replied, “Honey, I guess you forgot to add a touch of grace.” Whatever the real story of the name, these biscuits remain popular and appear in many a Southern baking book. One of the key ingredients for the recipe is Southern self-rising flour. Most Southern bakers insist that the only flour to use is White Lily flour. To the dismay of many, the original mill in Knoxville, TN closed in 2008 after operating since 1883. Production was shifted to two mills in the Midwest by the new owner, the J.M Smucker Company, who insists that the new product is indistinguishable from the old. Blind testers refute that statement and have demonstrated that they can tell the difference. Some Southern home bakers resorted to hoarding the old stuff when they learned of the plan to relocate the mill. Apparently, there were many reasons that White Lily was different from the flour that you buy at grocery stores outside of the South. Perhaps most importantly, White Lily was made from softer Southern wheat with only about 8 percent protein while Northern and Midwestern flours are milled from wheats with 10 to 12 percent protein. The flour was supposed to be ground more finely, bleached with chlorine rather than other bleaching agents, and sifted several times before packaging. Even without the original White Lily flour, Touch of Grace biscuits are light and delicate. I can only wonder how much better they would be with White Lily. Here is the recipe as my daughter sent it to me. The ingredients are exactly the same as the original by Shirley Corriher with some minor modifications in the method. The dough will be much softer than usual biscuit dough. That is why you don’t cut the biscuits but rather form them into rough balls and dredge them in all-purpose flour before putting them in the pan. Crowding them will make them rise higher. Combine self-rising flour, soda, salt, and sugar in large mixing bowl. Work in shortening using a pastry blender until the mixture is a pea-sized meal. Stir in buttermilk and let stand for 2 to 3 minutes. The dough should be soft and wet. 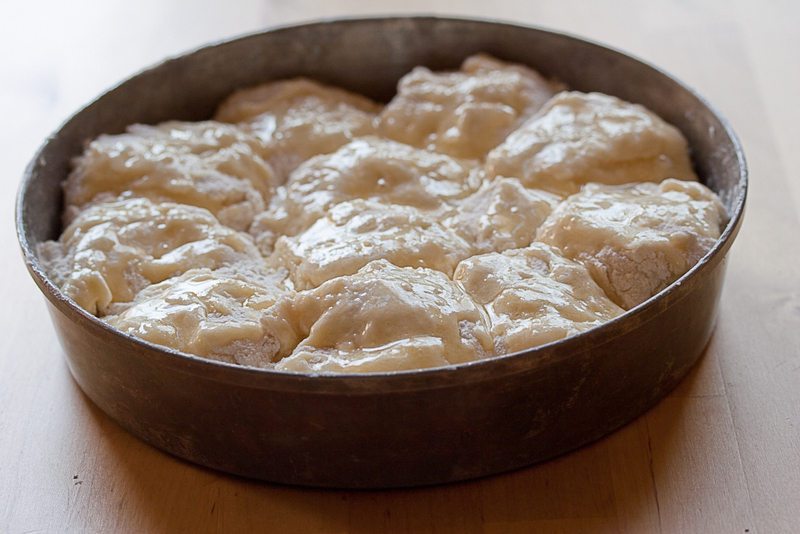 Pour the all-purpose flour into a pie pan. Spoon a lump of the dough into the flour, working and shaping it into a soft round. Shake loose any extra flour and place the round in the greased cake pan, continuing to shape and place biscuits until the pan is full. Have the biscuits touch one another as you fill the pan. Brush the tops of the shaped biscuits with the melted butter and bake for 15-20 minutes until the biscuits are a golden brown. Serve immediately. As an aside, self-rising flour is a fairly standard Southern ingredient which may be relatively un-used or even hard to find in other parts of the country. Exactly what is it? Self-rising flour is a regular flour that has been pre-mixed with baking powder. Because of that, you should not use it when a recipe calls for yeast as a leavening agent. If Southern-style self-rising flour is not available, you can make your own by sifting together 1 cup all-purpose flour, ½ cup “instant” flour (Wondra is a popular brand which contains a mixture of wheat and malted barley flavors) and 1½ tsp baking powder.